(CNN) -- About 11.6 million Africans have been forced from their homes by wars and other conflicts, according to the United Nations. Next week in Uganda, leaders from across the continent will converge to tackle the issue. Somali women at a camp for displaced persons. Nearly half of the displaced people in the world are found in Africa, according to the United Nations. "Africa is the continent most affected by the scourge and tragedy of forced displacement," the U.N. High Commissioner for Refugees said in a statement. "While refugee populations have declined in recent years, internal displacement continues to rise and the number of people uprooted from their homes is mounting." During the weeklong African Union summit that will start Monday in the capital, Kampala, the leaders are expected to sign a pledge to help the displaced across the continent, according to the U.N. agency for refugee issues. The agreement "would be the first legally binding international instrument on internal displacement having such broad regional scope," the agency said. Aid agencies have blasted some African countries for failing refugees and internally displaced people. Last month, Oxfam International released an explosive report accusing Kenya and Ethiopia of housing Somali refugees in overcrowded and unsanitary conditions. 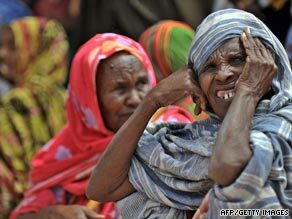 It said the Somali government also is abandoning its internally displaced. "Somalis flee one of the world's most brutal conflicts and a desperate drought, only to end up in unimaginable conditions in camps that are barely fit for humans," said Robbert Van den Berg, a spokesman for Oxfam International in the Horn of Africa. "Hundreds of thousands of children are affected, and the world is abandoning the next generation of Somalis when they most need our help." On a visit to a refugee camp in northern Kenya that houses Somalis, actress and U.N. goodwill ambassador Angelina Jolie called it "one of the most dire" she had ever seen. The camp -- which has facilities for about 90,000 -- houses 280,000 refugees. "The toilets are already overflowing," Jolie said last month. "There is not even enough space for trash dumps, so people are living amongst the garbage." Kenyan officials have said they are working on a solution. In neighboring Uganda, a government spokesman said it had taken steps to ensure displaced people and refugees have access to resources to become self-sufficient. "The numbers of displaced have drastically gone down," Fred Opolot said. "The government offers them relocation packages, including planting seeds, cooking items and building materials." The east African nation has followed international protocol, Opolot said, noting that it was chosen to host the African Union summit on refugees. "Uganda does not just set up camps; it builds facilities for them," Opolot said. "There may well be some African countries that have not followed protocols. ... The summit will reassess the challenges they have and set up steps to ensure they follow international protocol."